Our mesh fencing provides a high degree of added security due to its anti-vandal features established in its manufacturing process. 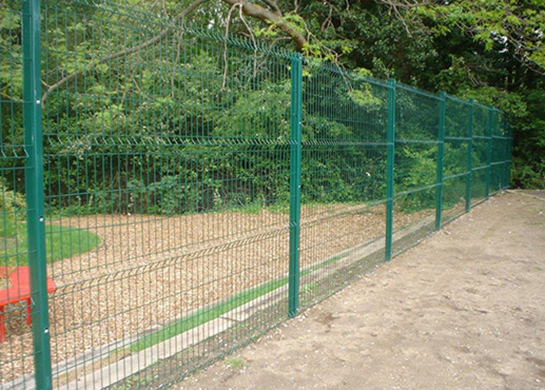 This durable and versatile fencing provides an extremely cost-effective boundary protection with its anti-climb, anti-vandal options. It also offers good visibility and has an aesthetically pleasing appearance, while remaining an economical fence system. Our mesh fencing is available in a variety of sizes to meet your security needs, and a range of colours to suit all environments and applications - from schools and airports, to industrial estates and retail premises. All of these profiled and flat panel systems combine a pleasing aesthetic appearance and secure rigidity. The galvanised longitude profiles are relied upon for their high-performance resistance to cutting and climbing and can all be easily fitted to steel posts. Paladin systems are a welded mesh product with a varying spacing of its horizontal wires. This stripe effect combines a pleasing aesthetic appearance and secure rigidity and has the added advantage of making the fence difficult to scale. The systems are relied upon for their high-performance resistance to cutting and climbing. Paladin and Multiplus offer the same welded mesh panel system as their counterparts, but with a varying decorative effect due to the spacing of its horizontal wires. The resulting attractive stripe effect has the added advantage of making the fence difficult to scale. Exempla’s welded mesh panels can be easily fitted to steel posts. Its galvanised longitude profiles form a strong, yet attractive, rigid fence. Eclipse is a profiled panel system which offers an economical alternative. This fencing is also constructed from welded mesh panels, featuring longitudinal profiles. Although an economical alternative, it still provides a high level of security. Multiplus offers the same welded mesh panel system as its counterparts, but offers the similar benefits of paladin with a varying decorative effect due to the spacing of its horizontal wires. The resulting attractive stripe effect has the added advantage of making the fence difficult to scale. The Dulok-868 offers an extremely secure mesh fencing solution. The double wire panels are an ideal choice where anti cut through fencing is specified. The Securus profiled panel system continues to grow in popularity in high security applications. The rigid welded panels, although very dense, still manage to have very little impact on the surrounding landscape. This system, as the name suggests, features flat rigid welded mesh panels. The dense flat mesh provides an effective surface and is a popular choice in high security areas such as prisons. Both the Securus profiled and flat systems feature a very dense mesh but still manage to have very little impact on the surrounding landscape. They provide excellent high security solutions.